Hope everyone had a wonderful Canadian Thanksgiving Weekend! And didn't get too off the rails with the clean eating. I had a few cheats but nothing too crazy to report.......okay - I had one slice of pumpkin pie. Really just a sliver. A delicious forbidden sliver. Oh the memories! We got out of town for a couple of days and spent time with my family. I wish they lived closer. Sigh. At least they are driving distance. Our DVD player actually broke 1 hour into our 8 hour round trip. Panic. OMG - what are we going to do. Our kids watch very little t.v. at home, but on the road, we are all about the movies. But guess what............the kids survived. We all survived. We talked. They sang. It was kind of nice. 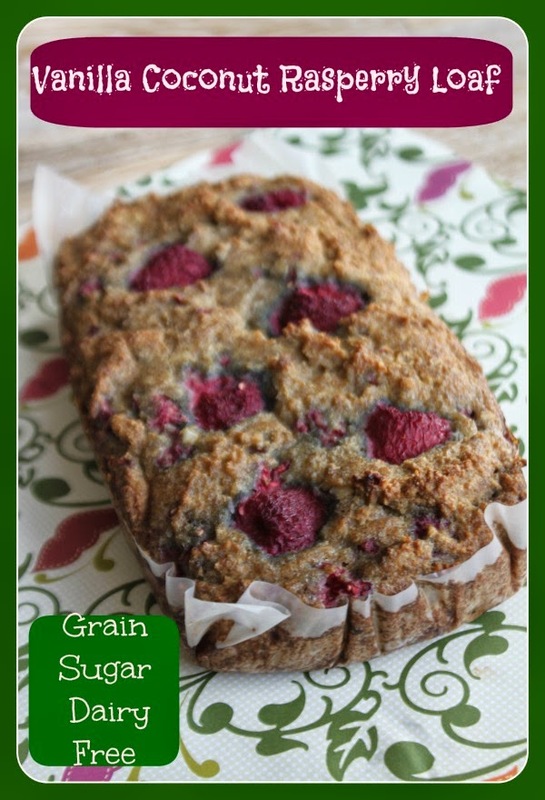 And this loaf is kind of nice if you are on the Candida or Paleo diet but want something for breakfast, a snack or dessert. Something low carb, sugar, grain and dairy free. Something delicious and legal. Enjoy - its not forbidden at all! Grease a loaf pan with butter or coconut oil. And line with parchment paper. Let stand for 5 minutes before pouring into loaf pan. Top with additional raspberries, optional. Bake for approx. 1 hour or until a knife inserted in the middle comes out clean.